At midday the entire plain suddenly seems to move in a bizarre way. In some way the Zeiss binocular has metamorphosed into a kaleidoscope. The gravel pavement is disintegrating in vapors of heat reflected from the baking ground. We’re passing through scenery full of lakes but they’re just phantoms under a quicksilvery sky. In the hazy heat, small pebbles turn into palmy islands. Like objects of an evil charm they shrink to their natural size as we approach. On the featureless plain only the wheels seem to roll but not the car itself. Flat as a pancake, the billowing environment provides no scale to indicate our movement. Due to the straining visibility conditions we quit and stop for lunch. At noon in April the Hammada is everything but a pleasant summer resort. Al Samum, the hot wind from the northeast, blows steadily, turning one’s throat into sandpaper a minute after the last sip from the ghirba. When the wind turns south, like right now, things get even worse. Al Dschumdschab, the Uburi Sand Sea’s glowing breath, haunts the plain as if a giant oven was combusting behind the southern horizon. As we man the car at three in the afternoon, the temperature inside is still 132 F°. 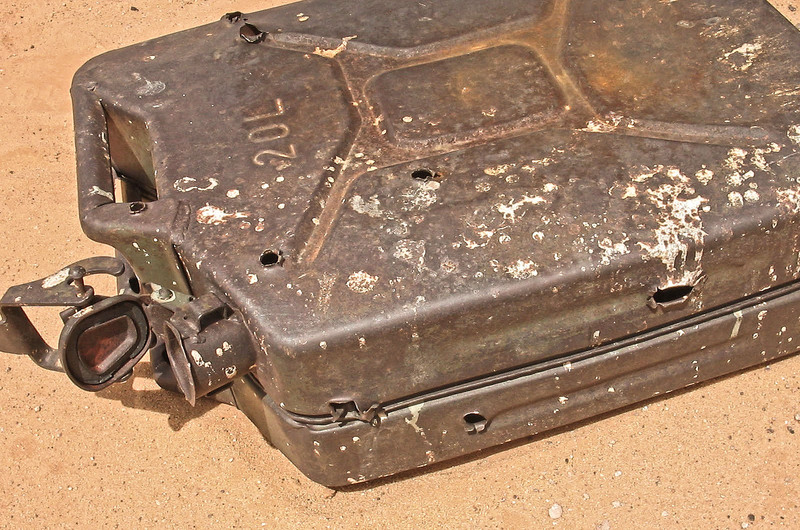 Our first sighting this afternoon turns out to be a bullet-holed jerrycan. Originating from an improvised Italian airfield from the North African campaign, the canister bears the German army inscription “Wehrmacht 1941”. Although our party is focusing on extraterrestrial litter, we take coordinates and examine the place closer, since battle relics are quite uncommon in the central desert. Pierced Italian equipment, empty M 38 Carcano clips as well as plenty of British calibre 303 rounds add to the on-site findings. Back home the research will lead to the assumption that we came across the remains of a skirmish the T-patrol of the British Long Range Desert Group fought in late 1942. 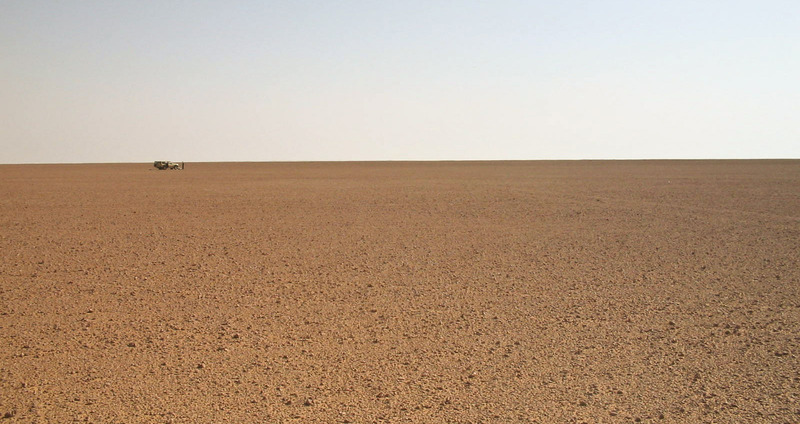 The desolate landing strip once served as an outpost on the air route to Murzuk and it was presumably not the most glorious day in the Duce’s Army when the LRDG raided the place. Keeping our initial goal in mind, I bring my team back to work but not before Ammul, our fearless cook, has successfully excavated a 1940 pattern canvas sleeping bag. His booty tied to the car for “dry cleaning” in the airstream, we’re ready to continue. Like most of the HaH, the area we reach at dawn is criss-crossed by a dense spider web of tracks. We pass single meteorite look-alikes around which the tracks circle. Marks that bear witness of the countless hunts combing the terrain for space debris in the past. We add a few of these desert “crop circles” but none of the encircled rocks qualifies for cosmic pedigree. Despite a couple of bullet holes the German army “Jerrycan” is still in good shape. It bears a production stamp of 1942. The Jerrycans were a favoured booty for the Long Range Desert Group since the British 4 gallon drums appeared to lack robustness. Although the searchable area on the HaH spans a vast 50,000 km2, the two decades of prospecting have obviously taken their toll. The glorious days of finding a dozen different falls in one afternoon are irretrievably gone. But the Ah’schar nayzak, the black thunderstones, as the locals call them, are still out there. We know how meteorites in the field look like, but from previous expeditions I also know that an initial find is always needed to adjust one’s search pattern. 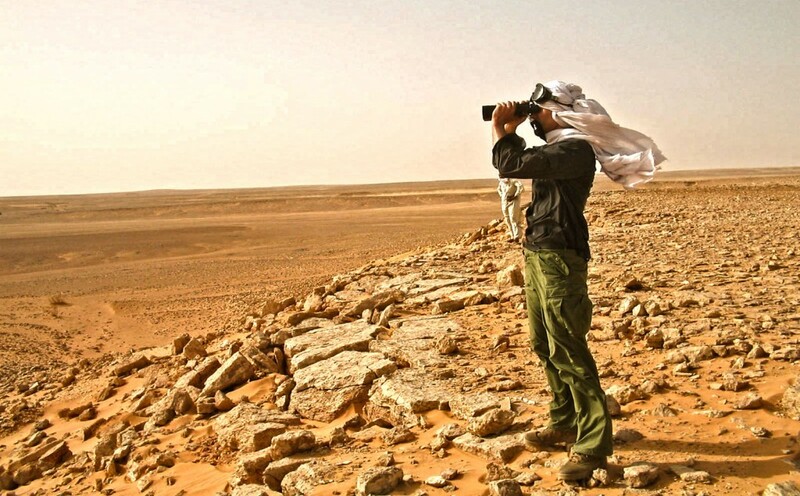 While the Touareg friends ask Allah for assistance, I follow the saying, “Trust in Allah but tie your camel” and carefully plan our next day’s route. Hour by hour the martian-like scenery passes by in monochrome red. Unlike the Dar al Gani, the HaH is intersected by numerous queds and rocky slopes: natural obstacles that hamper any systematic large scale survey of the area. On our way north the next morning the free plain narrows towards a rise impassable for the Landcruiser. It takes us a few miles of scouting through winding gullies before we manage to climb on a perfect surface and start prospecting again. Hour by hour the martian-like scenery passes by in monochrome red. At noon we drive past the mummified cadaver of a camel. Its sun-parched skin is flapping against the bleached bones to the rhythm of the Samum. 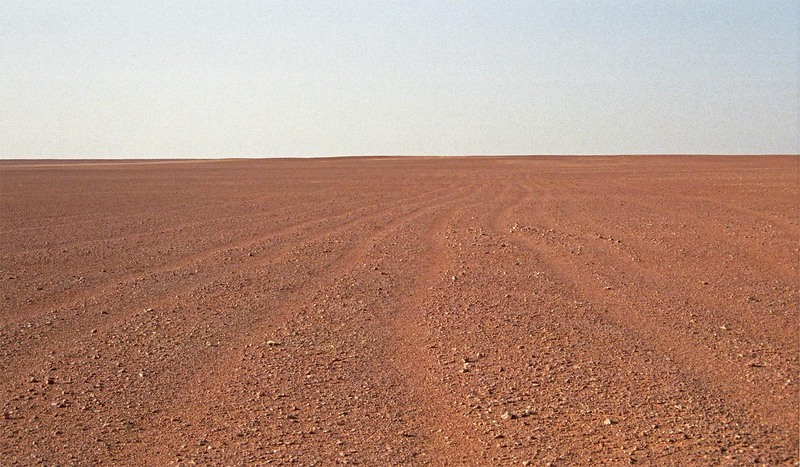 The legendary caravan trail that connected the Nubian coast wiht the shores of Lake Tchad until the late 19th century. As bundles of fresh tracks disturb the natural surface, we know the piste to Ghadames is close. Saleh joins the broad runway to the southeast to bring us to our nightcamp destination. The team is jaded. Since noon they have started seeing dschinns all over the place. To save resources I quit the search for today and so we speed up to reach unsearched terrain by nightfall. While Saleh interjects his new favorite song “It’s a long way to Tipperary”, I peer in the car’s window opening for a better view. With the sun at our back the day might not be over yet. A few Tipperaries later, suddenly a black spot flashes by. No one else has seen it. Another deception? We’ve had enough of those today. Too many frustrations caused by galena and lydite pebbles spread abundantly over the western edge of the HaH. On the other hand, one could seize the opportunity of a brief halt, to take a cold sip from the ghirba. The waterskin is dangling outside in the airstream. The boys surely would need one too. No doubt they look pretty dry. A slap on the roof is the signal to turn about. Saleh sharply speeds down, turns slowly into our dust trail and drives back alongside the fresh tracks. Blood, sweat and tears, and in the end: A Meteorite. Our first Libyan find was later published as HaH 335, a 111g type 3 chondrite with a low weathering grade of W1. The sinking Sun is blinding. Six hundred yards passed and still nothing to be seen. Finally, there it is. Like one hundred times before, I grab my magnet and jump off the car. Bending down towards the rock I catch a swift glance and turn back towards the car by automatic reflex. But now I grasp the image: subtle contraction cracks on a pitch black velvet crust, appearing as fresh as if the thunderstone had fallen the previous night. 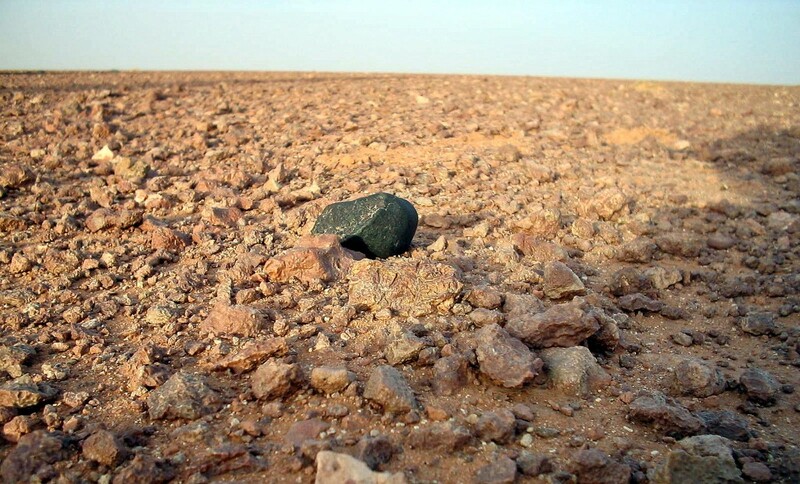 “Alhamdulillah, huwa alraqum awwal”, “We’ve just found our first meteorite” I call to the boys. As they see me kneeling in front of the fresh potato-sized stone, they break out cheering too.